Alligator, Inc. has been a provider of expert flight testing services since 1982. Company Founder and President Ron Renz is an ATP rated pilot with 4,000+ hours and 60+ aircraft types in his logbook. Alligator has managed flight test programs, provided pilot/test pilot services, designed and manufactured modifications for aircraft ranging from simple singles all the way to the Boeing 747. Alligator was a pioneer in the development of the rules created by the FAA to accept non-manufacturer's data for the ceritification on Flight Training Simulators. Many of our flight test programs have laid the foundation for certification of aircraft simulators. Our primary business is flight testing for the purpose of aircraft or component certification to US FAA standards, and also for international certification standards. We take part in the actual flight test operations, especially where these require instrumentation, data acquisition, and data processing. We can provide overall program and airplane operations management, flight and ground crews, test equipment and facilities, data processing equipment and services, and liaison with the FAA for certification. 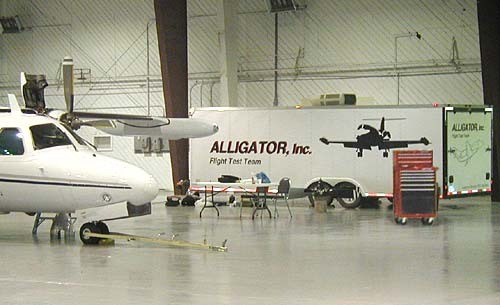 Whether it's scheduling the test program and staff, modifying and instrumenting the test aircraft, locating and leasing the test airplane, or securing all needed equipment and test facilities, Alligator has the experience that translates into a smooth, efficient and productive flight test program. Alligator's forte is instrumented flight testing using computerized data acquisition systems. Our specialties are instrumentation configuration, detail design, parts specification and procurement, and hardware implementations. We can install, test, de-bug, calibrate, operate and remove instrumentation and document your test program. Alligator has its own in-house microcomputer-based test instrumentation and can support fully-instrumented flight testing with its own equipment. This equipment is fully portable and can support test programs at whatever test site is the most appropriate for the task at hand. In other words: Have system will travel! Please click here for detailed information on Alligator's data acquisition system. Alternatively, we can support or set up your own in-house data acquisition capability. We have recent hands-on experience with numerous system sizes and capabilities. This includes anywhere from small 1-2 channel systems all the way to multi-channel 400-800+ channel systems.We have worked with all types of acquisition systems, including: analog, digital, analog/digital hybrids, telemetry, low data rates, high data rates, FM/FM systems, paper strip charts, spectrum analyzers, etc. We can assist in the design and production of instrumentation systems, as well as support any related training of personnel. The end goal of this instrumentation capability is to support flight test programs for certification purposes, or to conduct research and development testing. The end result is well-documented airplane flight test programs that generate accurate and complete data. This makes the certification process more predictable and ultimately results in cost savings. The systems we work with and the techniques we use are accepted by the FAA. Alligator can provide data processing and data analysis as required to meet your program needs. We can provide data that your DERs or in-house personnel need, or we can provide the DER support or other data analysis required. We can provide all needed flight and ground crew personnel for any phase of the program. We always prefer to have client engineers or technicians on site during flight testing, but we can provide any needed personnel that the client is not able to provide at the time. We have pilots, A&P mechanics, engineers, technicians, DARs, and DERs available to assist with any program needs.